Andre is a true story about a male harbor seal born on May 11th, 1961 and died in July of 1986. He was found as a pup found off the isle of Robinson’s Rock in Penobscot Bay by Harry Goodridge of Rockport, Maine. Harry and his family raised the pup with hope that the pup would return to the wild. Harry was the Harbor Master of Rockport, Maine. The family name was changed to Whitney in movie. The movie was released by Paramount Pictures. Andre grew up and learned how to get himself into trouble. Another fisherman of Rockport named Billy Baker did not like Andre. Billy thought seals were causing problems with his ability to catch fish and lobsters and crabs. Billy was also mad because Harry was appointed Harbor Master and not him. The origin of Andre’s name was given as Andre from the Author of book that was in Whitney house. The seal gains popularity from his almost tricks and even shoots a basket in one scene with Whitney son 16 year old son. Andre even attracts media attention. There is even mention of Andre appearing on Ed Sullivan Show. The child that helped take care of Andre and named him was Tina Majorino. She played Toni Whitney. Toni took care of Andre and taught him many tricks in movie version. 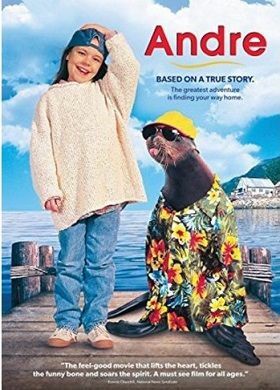 Andre was played by Tory the Seal in 1994 movie. I recall that Tina also played child actor in movie water World. The seal also caught attention of Department of Games and Wild Life. Andre had to be let go into wild. There was big confrontation between Harry Whitney and Billy Baker. Billy was one that alerted officials that Harry and family were keeping seal instead of letting go to wild. This is a major violation of law. The sea has to be released to waters it was born in or family would face fine or even prison time. Hard decisions have to be made by Harry. . It returned to Rockport every summer for rest of its life. The seal resided in movie at Boston aquarium during Winter. The story was narrated by adult Toni Whitney. She tells a story about how a seal named Andre changed her life to feel love for seal. There is also a book published about Andre in 1975 by Harry Goodrige and Lew Dietz. The book is named “A Seal Named Andre”. I also learned that Andre’s fame and popularity resulted in a memorial statue being built in his honour in Rockport, Maine harbor. I recently read that the statue is now in need of repair. The town is asking for donations to refurbish statue. Here is article about statue.